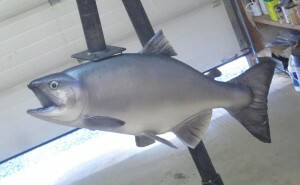 My Son caught a large silver salmon last fall while fishing in the Valdez area of alaska. 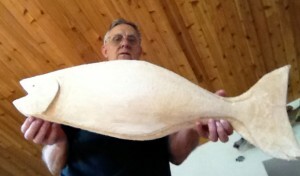 I was fishing with him at the time he caught this fish, and opted to carve it for him. He said okay, and so I took measurements off the fish at that time, and when I got home here in North Pole I had a chunk of bass wood in my garage and used it to carve out his fish. I did the fins and put them in separately and then I painted the whole fish. I am not a professional woodcarver by any means. I am retired and like to grab a piece of wood now and then and carve on it. I have no power carving tool, just hand chisels, and they are limited as well. Toggle Clamp Jig Design Contest: Win up to $100 Gift Card Woodworking Resolutions for 2013 – What are your resolutions for your workshop?